The Blue Toon’s stay at the top of Division Two was to prove a short one after a disastrous second half performance saw them crash to defeat. 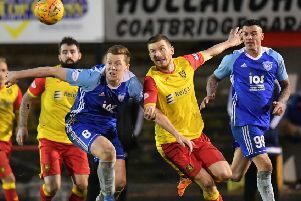 Peterhead made the long journey to Dumfriesshire as League leaders after their hosts had done them a big favour by defeating then top dogs Edinburgh City the week before. 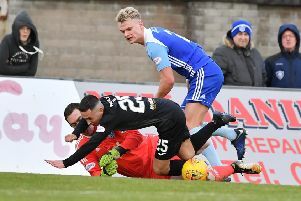 Blue Toon midfielder Simon Ferry was missing after he sustained a knee injury in the defeat of Berwick Rangers although he wouldn’t have featured anyway as he doesn’t play on artificial pitches. Jamie Stevenson returned after recovering from a back injury and Rory McAllister, goal hero the previous week, was once again on the bench as he worked his way back to full fitness. The horrendous weather at the Galabank Stadium saw torrential rain and a swirling wind making for testing conditions for players and fans alike. The home side kicked off and immediately had Peterhead pinned inside their own area forced to defend a long throw in then a corner kick in the opening couple of minutes. The visitor’s response was a Willie Gibson free kick from the right, whipped into the six yard box but a foul on keeper Alex Mitchell ended any thoughts of an early goal. The first clear cut chance came in the 12th minute for Annan. Some incisive passing saw Tony Wallace set up Tommy Muir and his low shot from the left side of the goal was deflected out for a corner. The Blue Toon responded immediately, Jamie Stevenson sliding a lovely low driven pass from the wing towards the back post only just missed by the sliding Derek Lyle. After 23 minutes Peterhead did have the ball in the net, Lyle turning in a Jack Leitch flick on but the stand side assistant put his flag up for offside. A Gibson free kick then found Lyle and his shot produced a decent save from Mitchell. The weather hadn’t improved much as the second half kicked off but the home fans were soon on their feet as Annan took the lead in the 54th minute. Defender David Wilson was allowed to drive unchallenged into the visitors penalty area and he unleashed a powerful low drive that cracked off the right hand post before running along the goal line then over it by the other post. Peterhead’s task was made even more difficult on the hour when Annan doubled their lead ironically just as they had a decent spell of pressure themselves. Full back Scott Hooper sat the ball up nicely for Tommy Muir and he made no mistake from six yards to give the home side what looked like a solid lead. Almost immediately Rory McAllister replaced Jamie Stevenson as the skies darkened and monsoon like conditions spilled from the heavens. It went from bad to even worse as Annan netted a third after 69 minutes, Muir again with a close range header and it looked like damage limitation was the best the visitors could hope for as Athletic went for the jugular. Muir should have grabbed his hat trick but keeper Greig Fleming bravely blocked from the rampaging striker then in the next attack from Aidan Smith to ensure a bad day didn’t get even worse.